Every one of my Christmas and Holiday cards has been enhanced to make them unique. Nothing makes an impression quite like these one of a kind cards. peaceful understated holiday card, this should fit the bill. This is an iconic Christmas flower. 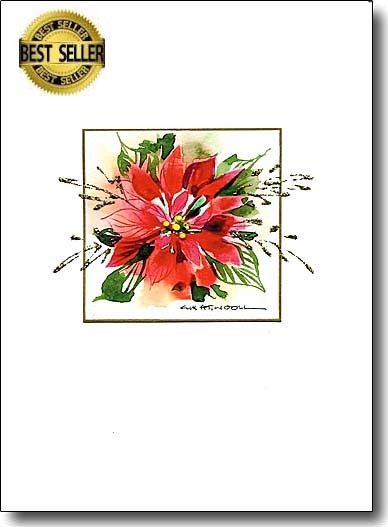 My painting is embellished with three raised gold stamen. In addition to sending this to anyone who loves gardening and flowers, consider putting it in a 5x7 gold frame and gifting it or using it as seasonal home decor. 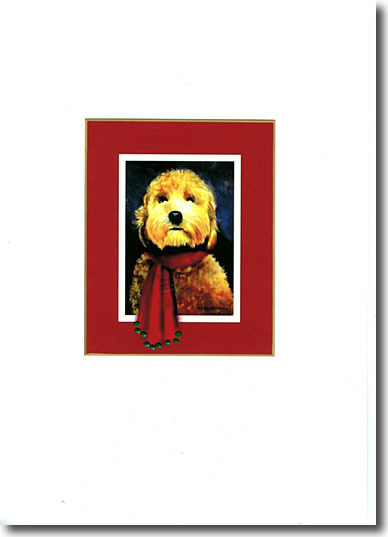 Here is a whimsical dog lover's holiday card. This delightful portrait of a Labradoodle dressed warmly for a walk always brings a smile to people's faces. The original painting is framed 16x20 and for sale. 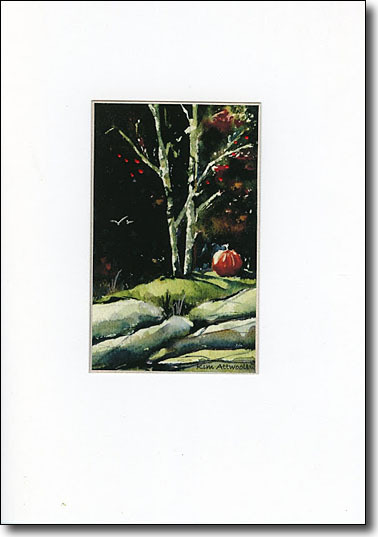 This autumn image was painted in Maine. 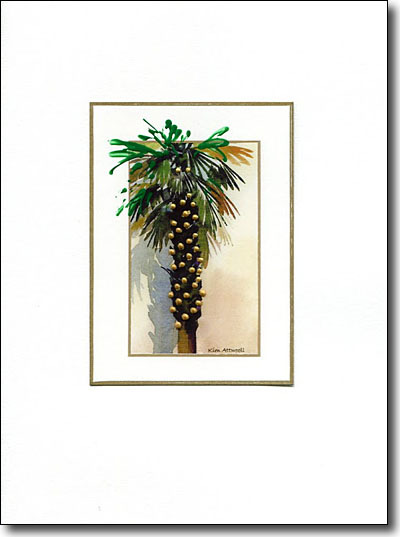 It is perfect for a greeting card for Thanksgiving or an October birthday. The embellishments are tiny dots of raised gold to suggest bright yellow leaves. 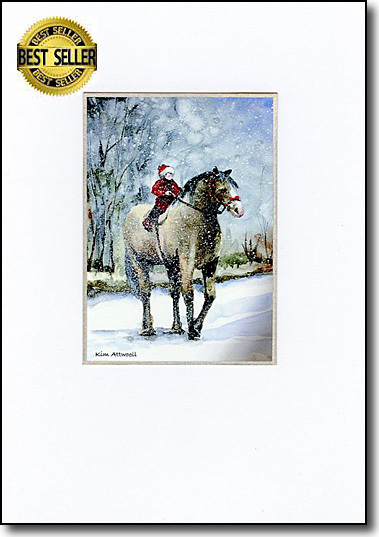 This sweet, whimsical image of a tiny child on a big horse in the snow is sure to touch the hearts of any equestrian. 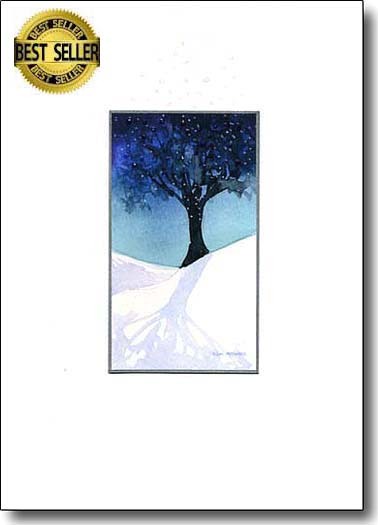 Sparkling snow enhances this silver edged print. It is a best seller. 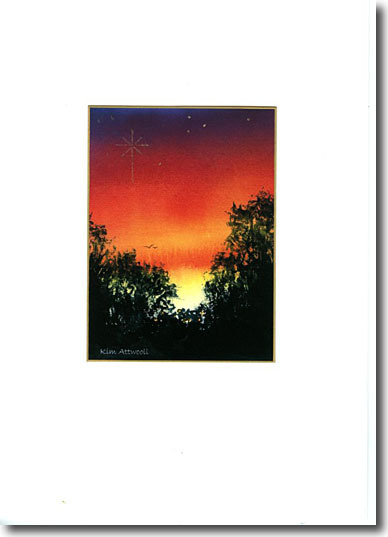 In this painting I have tried to capture the drama of Christmas Eve and the twinkling stars with one very bright star. 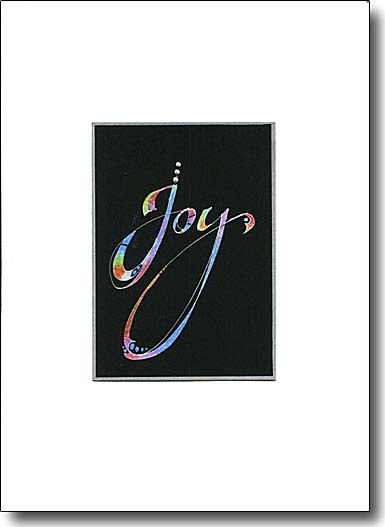 Due to the color of this card it is sure to stand out from the myriad of red and green Christmas cards. 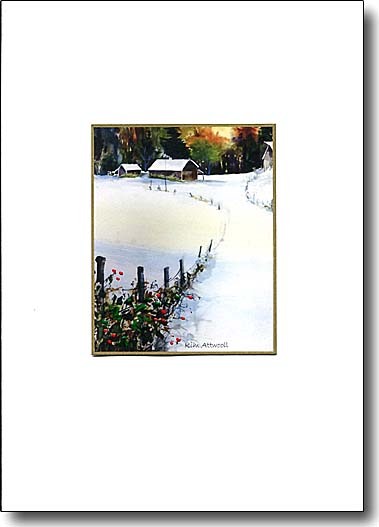 This peaceful card shows a warm winter sunset. 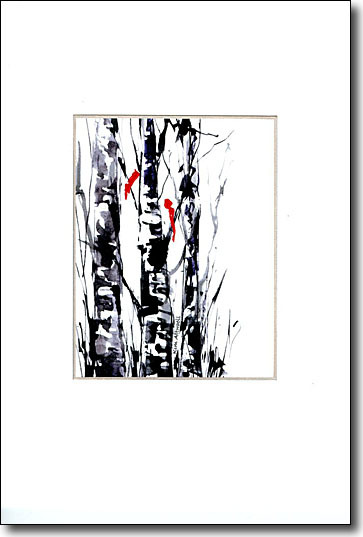 It is taken from a recent large painting that I placed over our fireplace for the winter months. 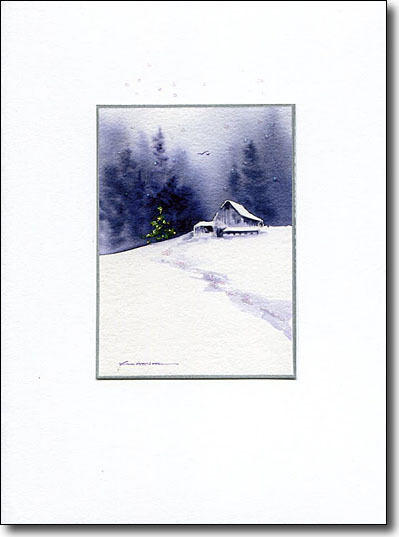 I embellish the berries and add sparkly footprints that step out of the image onto the card following the path to the houses. 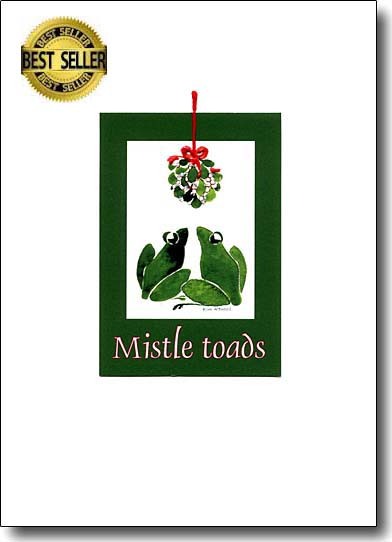 Mistletoe adds playfulness and love to a Christmas party. 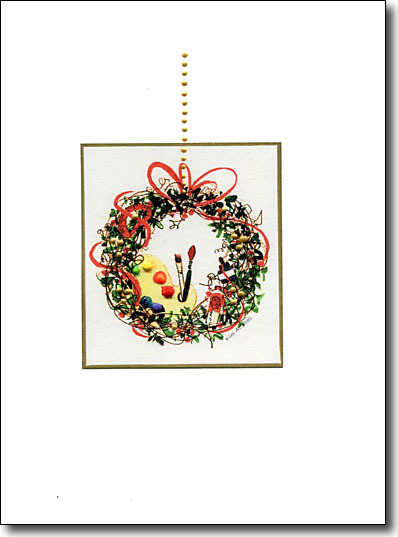 I embellish the white berries and bring the gold cord up onto the card. Send this card to someone that you want to kiss. Here's a simple graphic image that captures Christmas decor. The gold star is enhanced with bright metallic paint and pops. 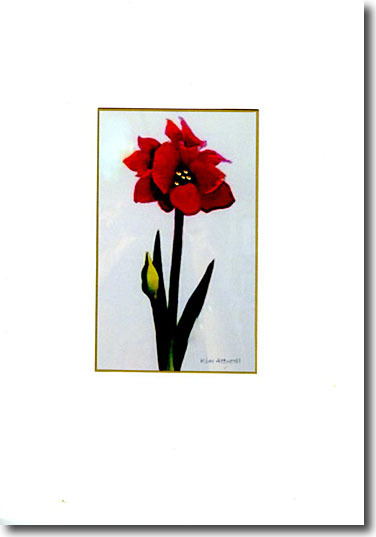 It will appeal to gardeners, decorators and even look wonderful in a 5x7 gold frame. 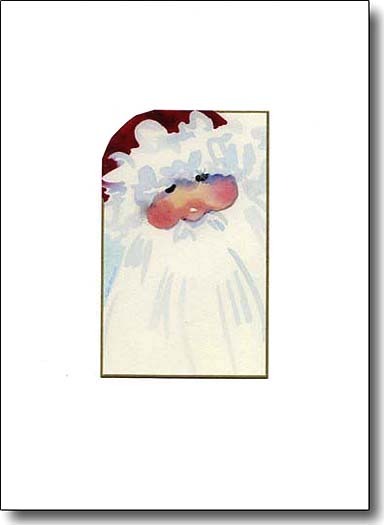 This whimsical Christmas card shows Santa with a twinkle in his eye. I cut away the corner to emphasize his bright red hat. 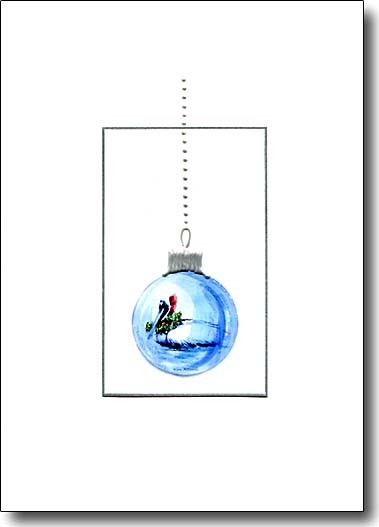 I had fun painting this glass ornament with a fir tree inside. The glass is enhanced with glossy sparkle and the ornament embellishment carries the chain out of the image. 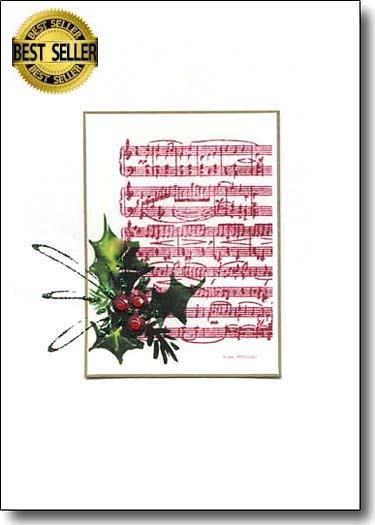 Celebrate the musical element of the Holidays with this sheet music and raised holly berries. 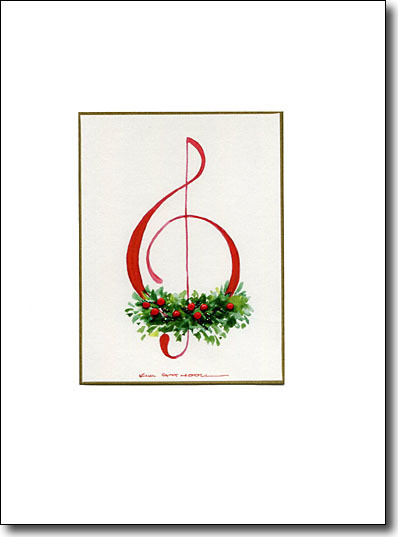 Musicians will love this card. 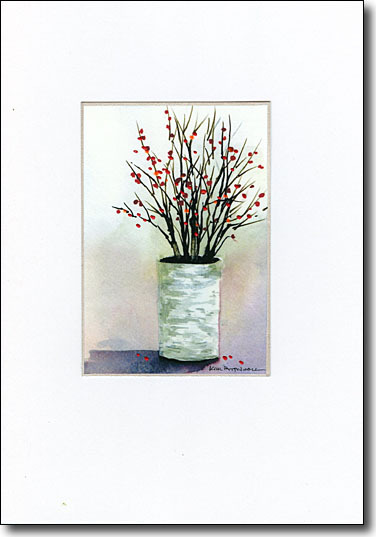 This is an understated painting of bright berries in a birch container. It is simple and natural with some berries raised with red and orange paint. This can be an all occasion card as well as a subtle holiday card. 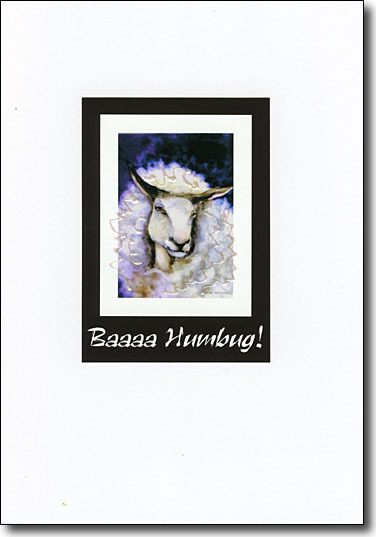 Here is a humorous card to send to your favorite curmudgeons. My ewe has an eye-catching shimmer on her thick winter wool. How about a card with a difference? The contrast in this image paints a compelling picture that gets you thinking about the deeper meaning of the season, our world, life, etc. It’s appropriate for so many other occasions, graduation, celebration, thank you and even birthdays. 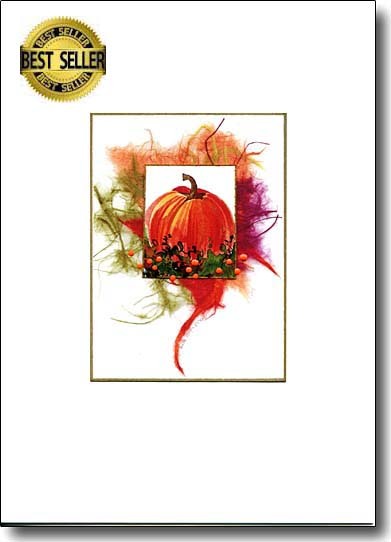 This glowing symbol of harvest and and Thanksgiving carries that message on this pumpkin collage card. It looks bright and beautiful on a mantlepiece for the holiday. 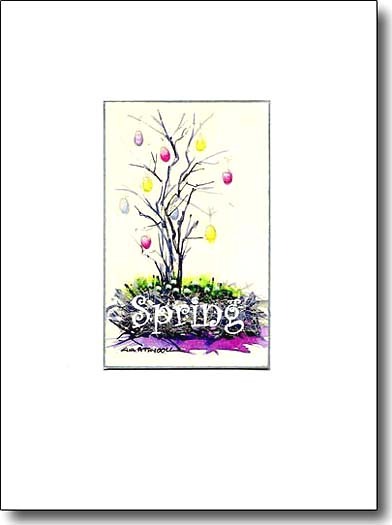 This Spring-Easter greeting card has glossy eggs hanging on a tree in a European fashion. 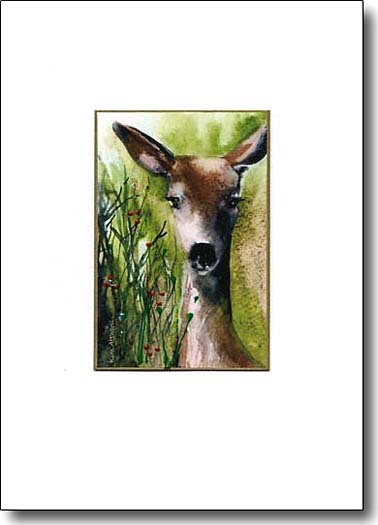 A peaceful and unique card is this deer amid icy berries. Many folks frame this as a gift. These guys appeal to so many people. 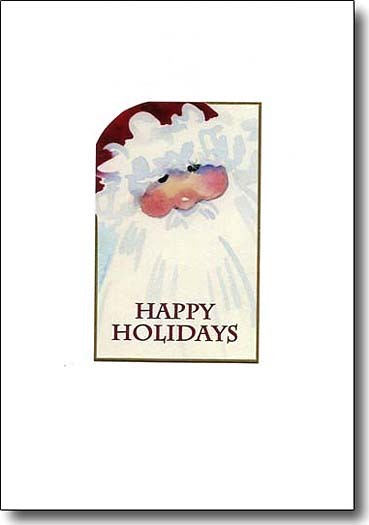 The humorous play on words and the red ribbon embellishment make this a holiday card you can enjoy giving. 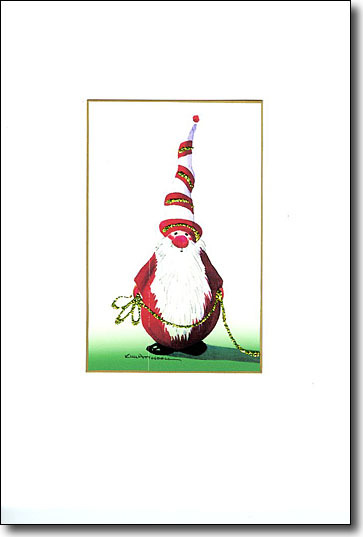 Someone has made a nice soft bed out of Santa's hat..the message is whimsically conveyed on this holiday card. Follow the sparkly footsteps into this holiday landscape. They take you right up to the Christmas tree in the center. 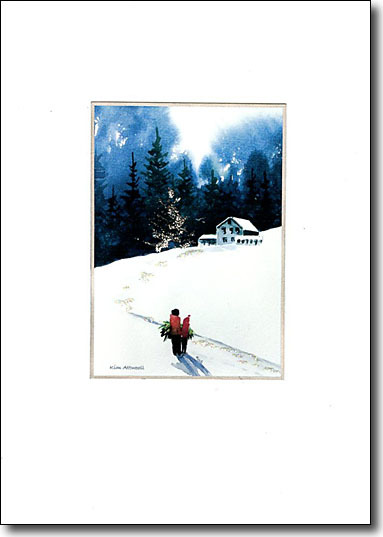 The card is a celebration of the crisp, cold outdoors. My Santa is more elf than jolly ole St. Nick. 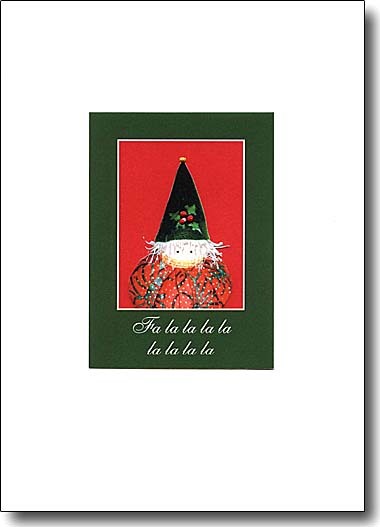 He has a sparkle in his eye and his hat is fetchingly cut out to make this card unique. 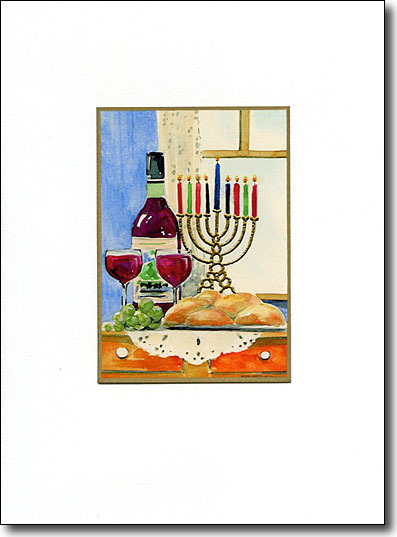 Hanukkah celebrations are portrayed in this painting. For many it is a great way to say the holidays are here. Music lovers will delight in this embellished treble clef. The berries and greens are jumping with sparkle and dimension. 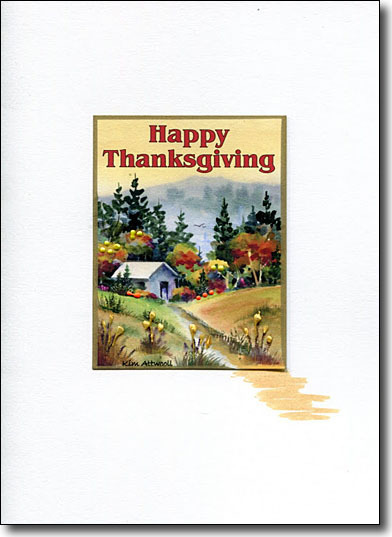 A warm and welcoming painting becomes a great Happy Thanksgiving card. 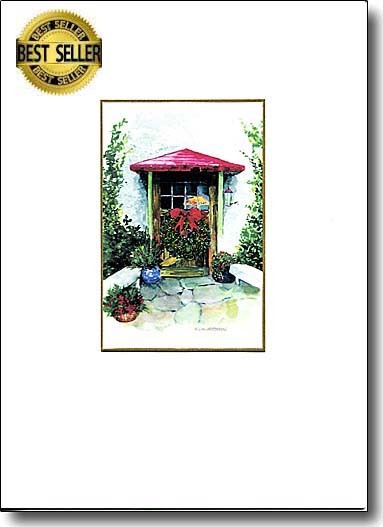 The quilter's cottage is enhanced with gold grasses and a watercolor pathway. 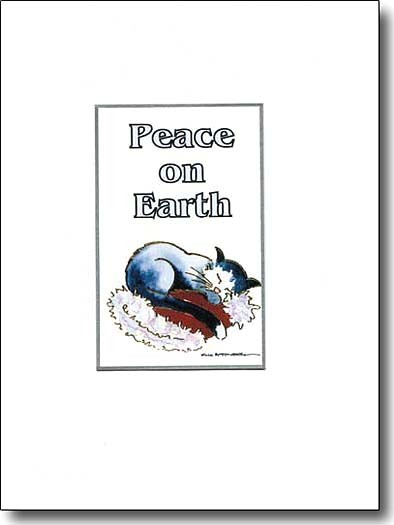 A very popular card, this is embellished with falling snow sparkles and gives a peaceful nonspecific holiday message. 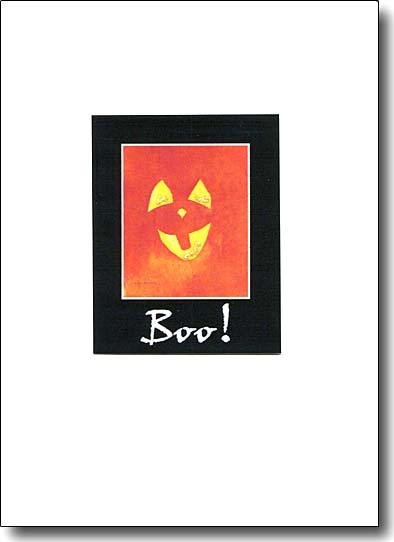 A smiling Jack-o-Lantern face is a playful Halloween card in candy corn colors. 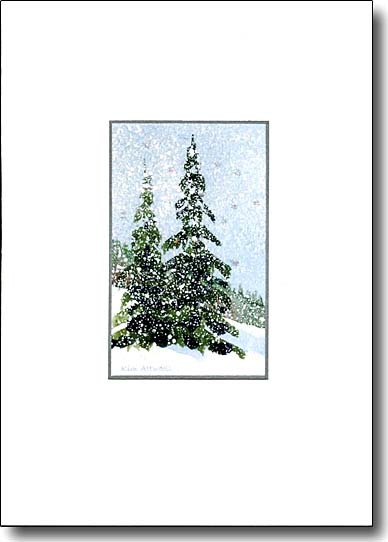 The snow is falling in sparkly dots over these peaceful fir trees. 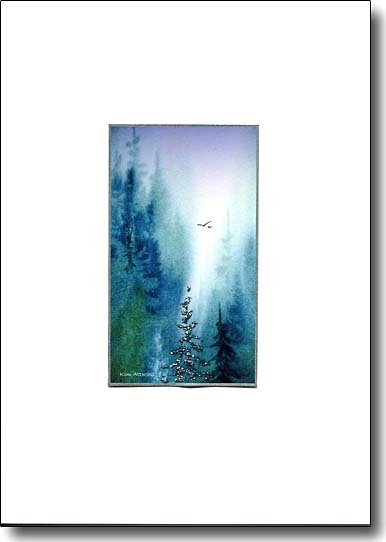 This is a calm and restful Holiday card that is sure to appeal to all nature lovers. 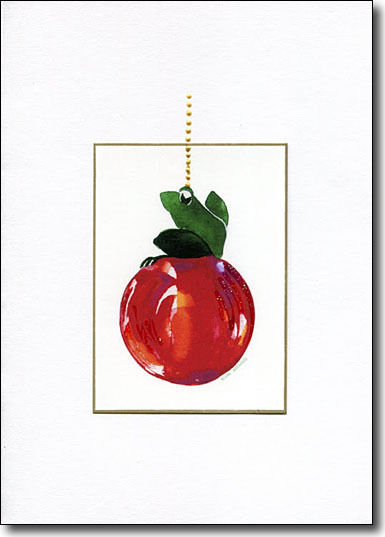 Bright berries adorn this musical Holiday card. The sheet music on rice paper is collaged with foil and crepe paper making a charming grouping to delight music lovers. 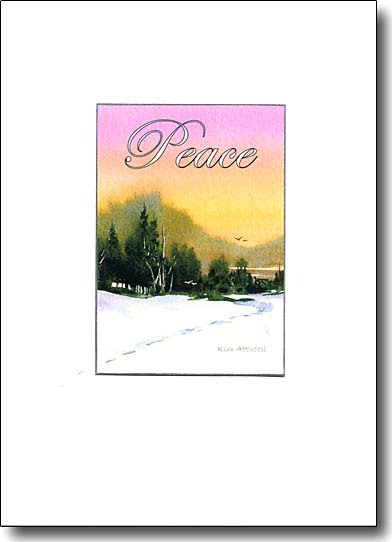 This loose watercolor was the perfect basis for me to add the word "Peace". 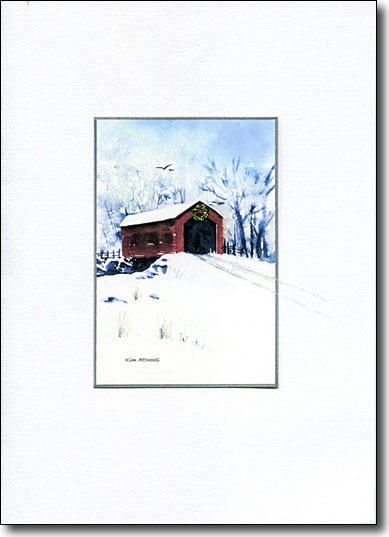 I enhance this Holiday card with sparkle footsteps in the snow that step out of the image and onto the card. 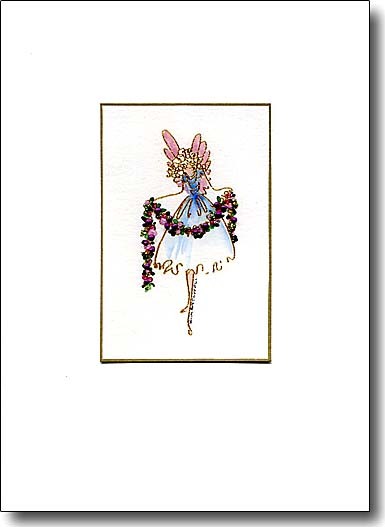 An angel bearing a lush sparkly garland is sure to delight all who receive her. The flowers are embellished with raised paint giving this image a charming dimension. 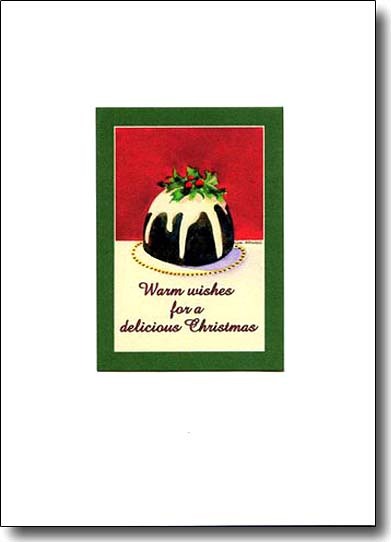 This delicious plum pudding Christmas card is embellished with plump holly berries and will charm all foodies on your Christmas card list. This painting adorns our chimney breast every Christmas. 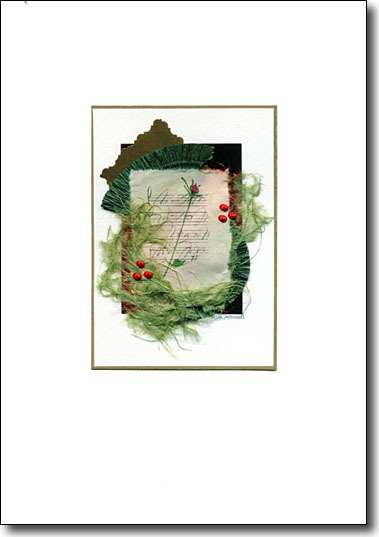 I love to embellish the greenery and berries and hope you might frame it for your home during the holidays. A long time favorite, my sparkle tree enhanced with hologram sparkles. 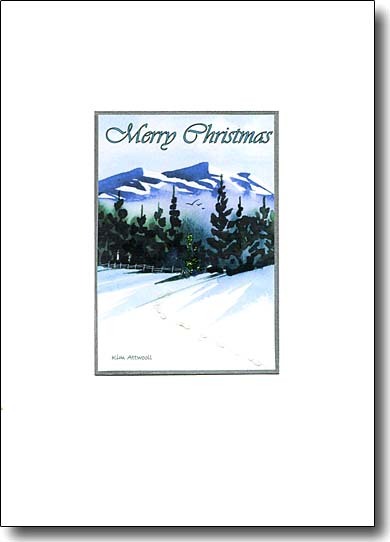 I've printed "Merry Christmas" into the image making it a serene Christmas card. I loved painting this serene landscape. It was painted wet on wet with detail added once the paper had dried. Even embellishing it is a pleasure when the sparkly Christmas tree is added. My silver tree stands out in the deep woods signifying that Christmas is here. 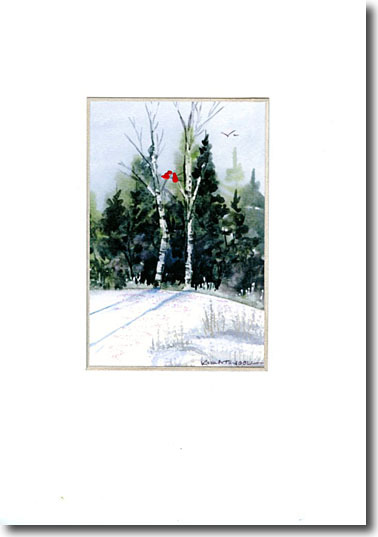 The two birds bring more life to this quiet Christmas card. A whimsical Christmas card is a photo of the Elf doll that I made with some of the words from the carol "Deck the Halls with Boughs of Holly". 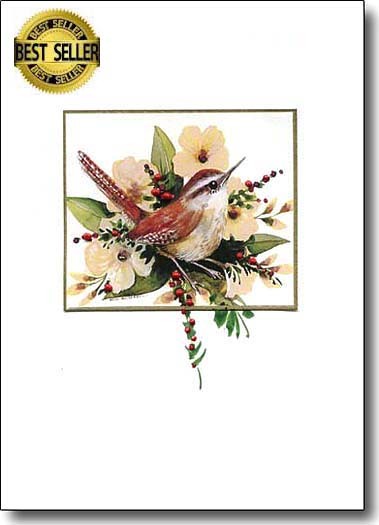 This cozy wren is nestled into plump berries that the embellishment carries out onto the white portion of the card. 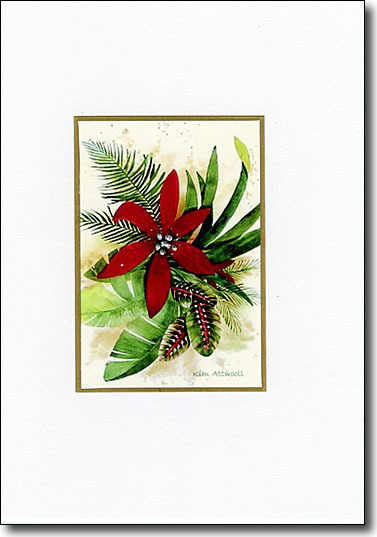 It is a very eye catching card to celebrate the holiday season. It was my good fortune to have grandparents who lived on the other side of a covered bridge. Painting this was a joy and awakened long forgotten happy memories. 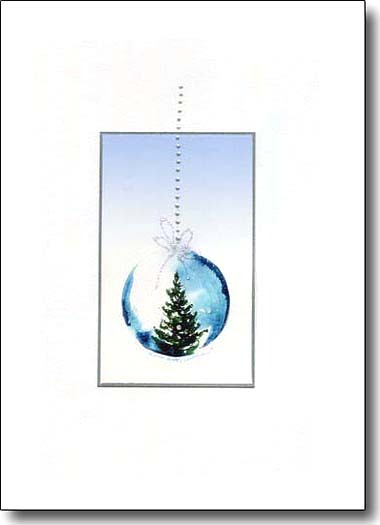 This is a great holiday card for artists to send and receive. The wreath is laden with art supplies. So much fun for creative people. 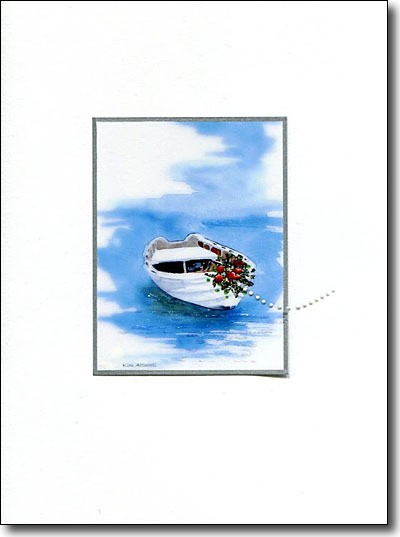 The Holiday Dinghy is a card to delight boaters everywhere.The dinghy has a sparkling wreath on her bow and a silver painter is added to suggest a larger vessel ahead. 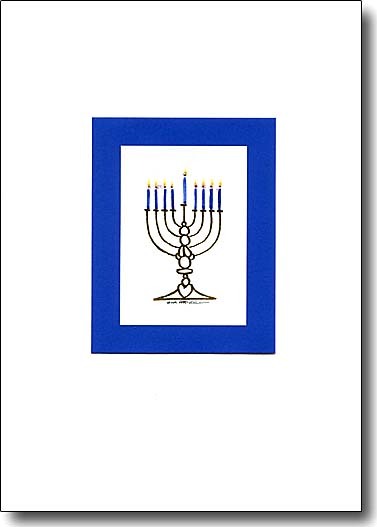 A Hanukkah card that is simple, yet makes you look twice as the candles are lit and the flames sparkle. 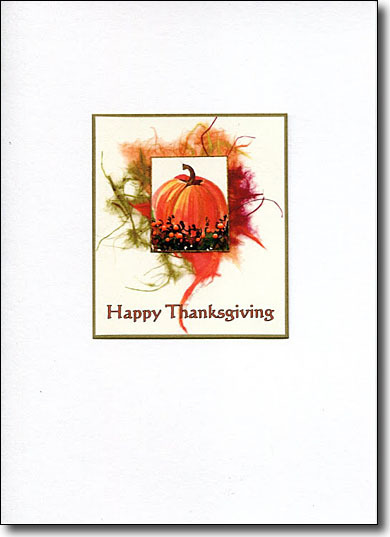 Here's a bright and cheerful card that is used to convey best wishes for a happy Thanksgiving. My pumpkin painting was placed over rice paper and enhanced with dots of raised paint. 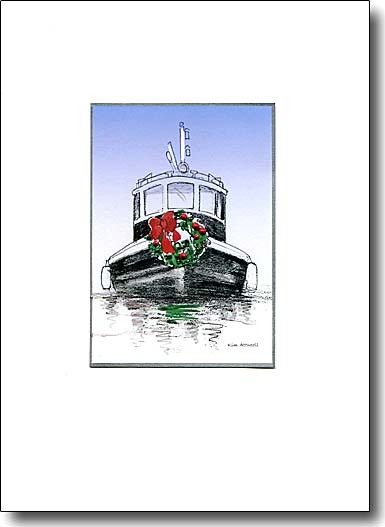 Boaters love this tugboat with a wreath on the bow. I embellish the wreath and add a raised light on the mast. This dramatic landscape is enhanced in two ways. 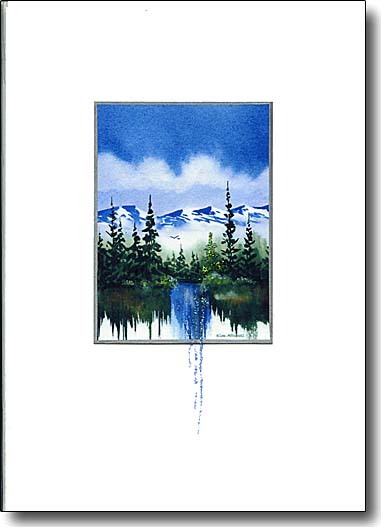 I place a Christmas tree at the top of the waterfall and then let the sparkling water fall off the edge of the image onto the card. This is a romantic Christmas card. A couple have found their own special tree and are carrying it home through the snow. The embellishments are their icy footprints in the snow. 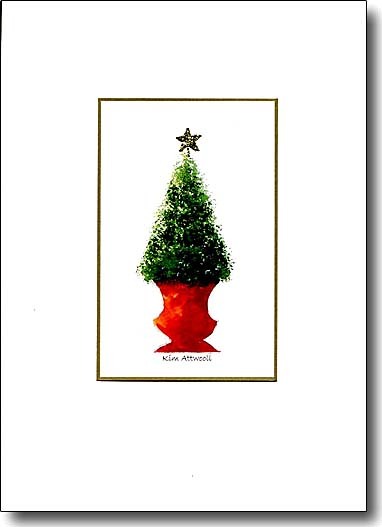 Here is another whimsical Christmas card. 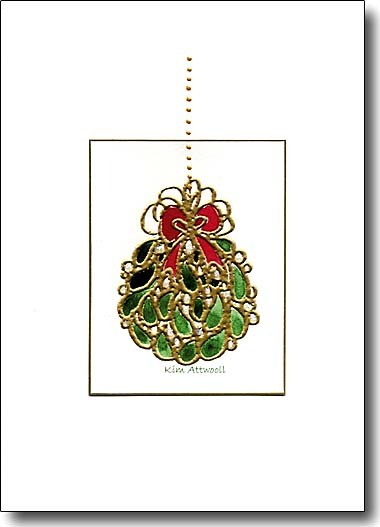 A bright green frog atop a sparkly red ornament. See how I carry the chain off the image and onto the card? 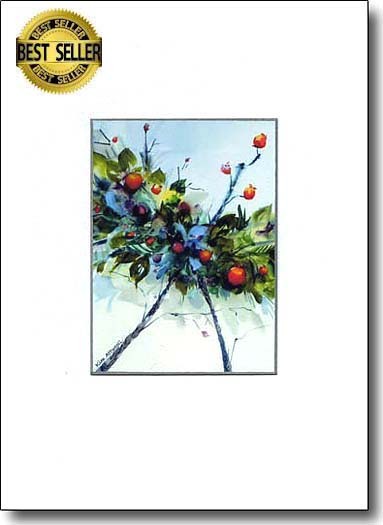 This painting is perfect for warm weather celebrants. The trunk of the palm is enhanced with a string of eye catching golden lights. A dramatic card with bold contrast and a focal point wreath. 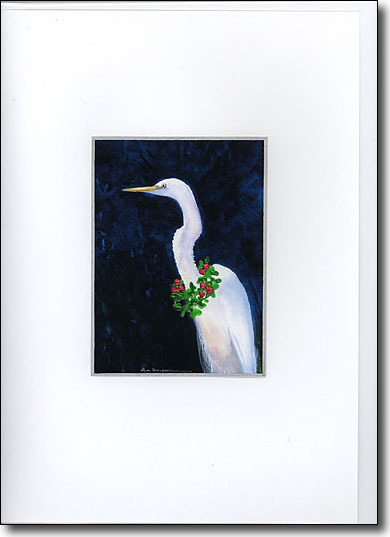 Bird lovers will appreciate this image and how it conveys a holiday greeting. This gold enhanced poinsettia is an explosion of color with raised yellow stamens. 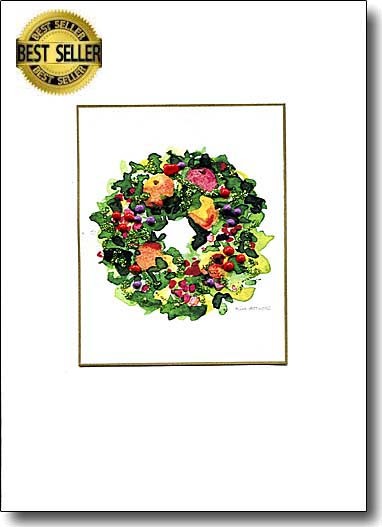 It symbolizes Christmas decor and is a best seller. This is a painting I did for a friend. 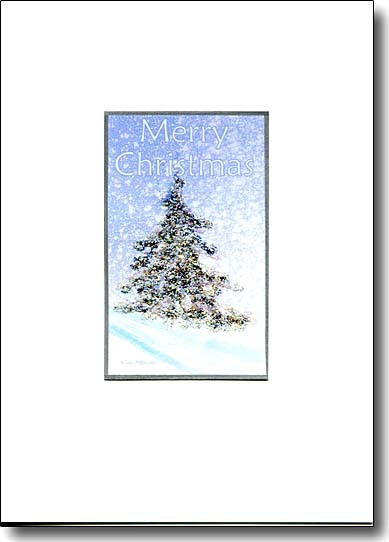 It converted to a holiday card and is enhanced with bright silver. I loved this calligraphy exercise. Adding the color made the message come to life. The raised white is a playful final touch. This is a fun painting. The vivid colors are mingled wet on wet and I scratch the veins in with a pin. 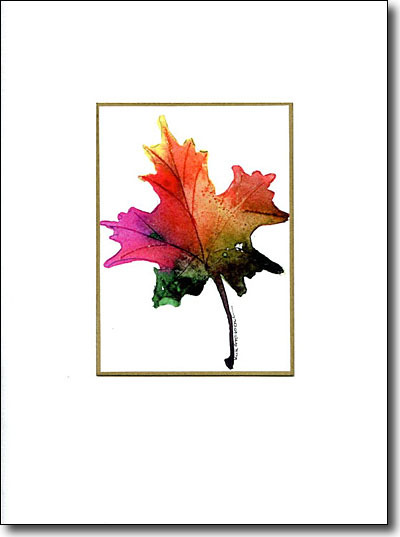 It's an appealing Thanksgiving card an appreciated year round by Canadians. 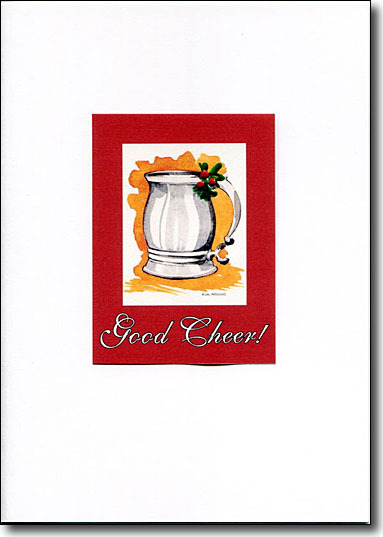 A pewter tankard accented with holly and berries is a Christmas card with oodles of traditional hospitality. It's a more masculine card and will appeal to pub goers everywhere. 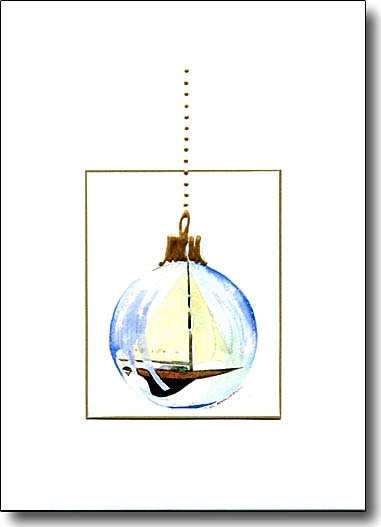 All sailors will love this sloop in an ornament. It's enhanced with a gold top and chain. 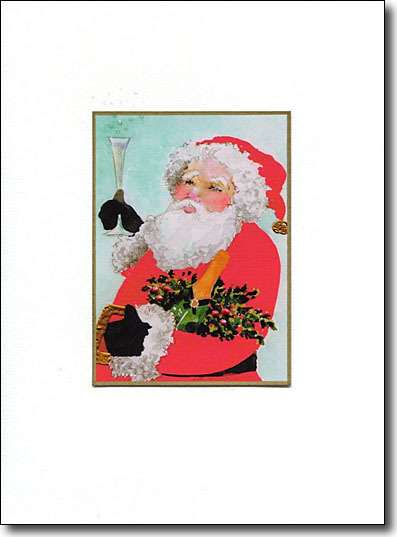 Jolly Ole St. Nick is celebrating with champagne in this image.There are raised holly berries in his arms and the champagne bubbles glisten with sparkles. This colorful and sparkly fruit wreath is brimming with holiday hospitality and is a favorite every year. 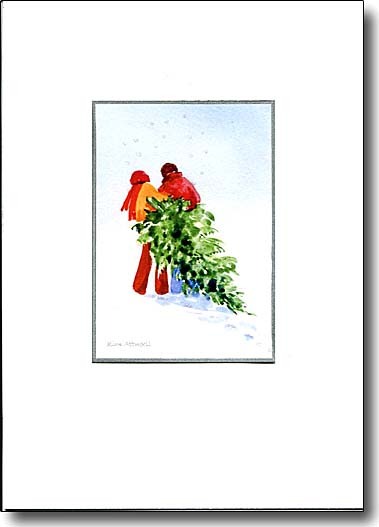 Another warmer weather Christmas card. My wreathed pelican is in a glass ornament. Another unique way of sending "Warm Holiday Wishes". What a bright, refreshing image. 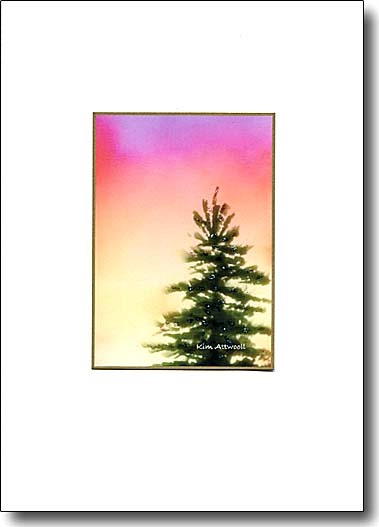 I continue painting the top of the graphic tree onto the card. 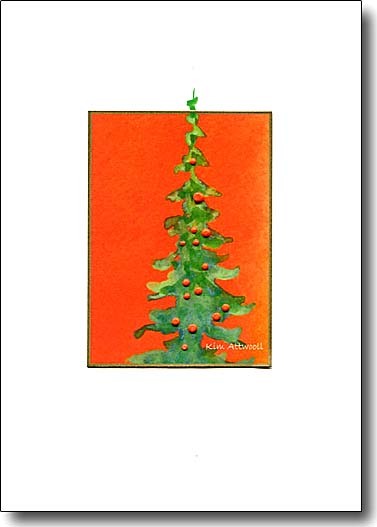 This holiday card stands out from all the rest due to the unique colors. 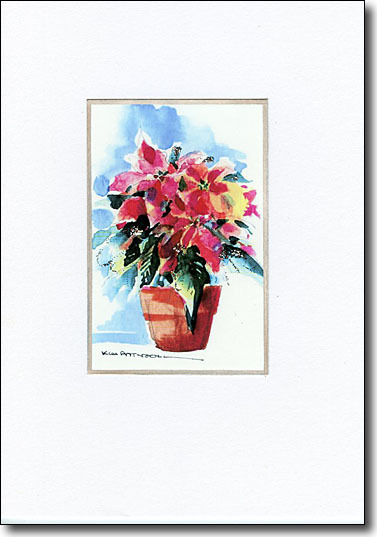 Flower lovers will find this pink poinsettia very appealing. 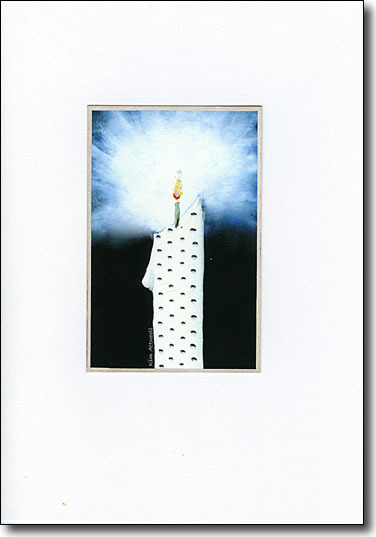 I enhance it with sparkling silver which makes it an even more celebratory greeting card. This iconic image is a hospitable holiday card. The wreath is embellished with hologram holly. A warm welcome is the message of this painting. 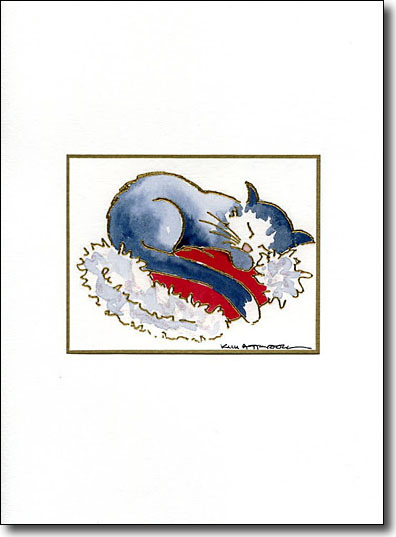 A kitty snuggled into Santa's hat is a great Christmas card to send to and from cat lovers. I loved painting this prism sky. It's wet on wet and I combined periwinkle blue, opera and bumblebee yellow. When the painting was dry, I used a fan brush with rich greens and added the tree. On the card, I put sparkles on the tree.